The following is an essay on the experiential learning benefits of live-action roleplaying games such as Adventure Quest. Founder and director of Renaissance Adventures. I’ve been a fan of roleplaying games (RPGs) since I was introduced to Dungeons and Dragons (D&D) in the late 70’s. As a teen, RPGs gave me a creative and social outlet I couldn’t find anywhere else. Throughout my 20’s, I played various RPGs as a hobby, and during that time I spent most of my summers working with children at camps and apprenticing with inspiring teachers. When I discovered live-action roleplaying games (LARPs) in the late 80’s, I recognized their potential as an experiential learning tool for kids and teens. While directing summer camps from 1990-1994, I experimented with a simple Native American themed LARP using foam spears, daggers, and arrows. The impact on those kids made it clear to me that a well-run LARP or RPG can challenge kids in diverse ways – physically, intellectually, socially, morally, and ethically. The youth were passionately engaged in the LARP. They learned a lot about themselves and others. I discovered then that roleplaying is an incredible tool for learning cooperation, teamwork, decision making, creative problem-solving, and self-esteem. LARPs, run in a certain style, encourage and support self-confidence, cooperation, critical thinking, and communication skills, and the kids have a blast! I moved to Boulder in 1995 and founded Renaissance Adventures with the dream to lead quests and inspire youth to learn through play. Since then, I’ve worked with hundreds of adult leaders and thousands of children and teens, co-creating a fun and inspiring experiential learning program through LARPs and tabletop RPGs. Over the last twenty-two years of developing LARP experiential learning programs for children and teens, I’ve seen what works and what doesn’t. Listed below are a few of my discoveries. Design the adventure to have a highly motivating plot – great tragedy will befall if the players do not act swiftly and effectively. Make it personal by passionately roleplaying those who are in need of aid, and potentially by tying the story into the personal history or actions of one or more players. Find ways for each player character to feel that they matter and they are needed on the quest. LARPs and RPGs offer frequent decision-making opportunities that have a large effect on the characters, world, and story. Quest Leaders (aka Referees or Game Masters) can hold a framework for the adventure, but must be flexible to allow co-creation by the players’ decisions. When players’ decisions clearly affect the storyline, they realize how important decisions are. This educates the players in the power of decisions, and gives them a very real sense of personal empowerment in all aspects of their life. Players learn by experiencing the in-game consequences of their decisions while feeling safe to experiment, explore, and make poor decisions without real-world negative consequences. When a poor decision affects the storyline negatively, the players experience the effects and learn from mistakes without any real-world consequences. In seeing how a well-crafted LARP is different than most standard RPGs, Consider the old-school gaming model of the dungeon crawls. The plot is often the same: open the door to the north; slay the evil monsters; get the loot; level up your powers; repeat. Not many decisions need to be made in that kind of adventure. Now compare it with a more complex situation that involves different political realms, races, and the conflicting needs and goals of diverse people. This more complex and realistic way of setting a storyline fuels an amazing, dynamic environment that requires creative problem-solving, ethical decision making, planning, and teamwork among the players. For example: The Ridgeback Dwarves tell tales of how the goblins of the Amber Forest are vicious, cruel murderers. When the Questers investigate, they discover that the goblins are simply protecting their harvesting ground from the dwarves’ wood-cutting forays. The goblins eat the fruit that grow on the trees, and hunt squirrels. The dwarves need wood for their forges and hearth homes. The example above is not complex – it is a very simple example. However, it gives the players the opportunity to perceive what’s really going on and to try to come up with a win-win negotiation for both races. A few solutions seem obvious when the goals are spelled out so clearly, but of course, learning the goals and motivations are a part of the learning process and the fun of the quest. If the players do not attempt to learn what is going on and think beyond what they are told by the Ridgeback Dwarves, they may charge in to slay the “murderous” goblins, akin to the typical old-school gaming model. The consequences for this blindly simple action – slaying the goblins – will create consequences that the players and dwarves must face. Perhaps a few goblin survivors escape and rally other, more fierce goblin tribes to take back the Amber Forest, and hunt down down the players in retaliation. Just think of the multitudes of lessons that participants can learn with this scenario. Learn how to brainstorm ideas and share feelings. Learn that you learn more by doing and from mistakes, and these “mistakes” are easily handled with acceptance and a light-heart. In fact, very often “mistakes” in a quest add to the drama and ultimately increase the feeling of shared victory when the quest is successful. Develop cooperation, teamwork, and communication skills through challenges that require that the players to invest in each other’s unique perspectives and powers, both in-game and personally. Every player, as well as the character each participant plays, has unique skill-sets and perspectives that the team needs. When appropriate, facilitate the group to hear each participant’s perspective, and to make a decision together as a group, not as one boss ordering the rest to follow. Children often let their emotions create an “us versus them” structure of morality. The mentality for many kids is: If a classmate takes a toy, the classmate should be punished immediately and severely. If a villain attacks a village, the villain is evil and must be killed. LARPs can reveal that most “villainous” motivations should not be viewed in such a black-and-white dichotomy. Villains do not need to be evil, and morality does not need to be portrayed as absolute. Instead, the so-called villains in a quest have complex motivations and goals. Astute Questers can puzzle out the true motivations of the characters they meet, and by seeking the best means of resolving a conflict, they can enact unique and creative solutions to the dilemmas they face in the quest and on the playground. This kind of discernment, and the resulting negotiations and problem-solving, translate into skills the players can use in real-life challenges outside of the game. When the Quest Leaders and LARP support an environment that is physically and emotionally safe, players can relax, engage, play, and learn. Physical safety is straightforward – if you are sword dueling with foam Swashers, point out potential hazards (such as rocks and trees), and get an agreement from the participants to follow the swasher dueling safety rules. Emotional safety takes a lot of experience and skill to support. If players are bullying, name-calling, taunting, putting down other people’s ideas, or teasing, then everyone in the group may not feel safe unless that behavior is dealt with swiftly, clearly, and with compassion and fairness. How to do that is a complex subject that is beyond the scope of this article – Renaissance Adventures has developed a program called Inspiring Invitations™, which explores this issue. Be a rolemodel of non-authoritarian and non-coercive leadership. Remember that everyone is entitled to the same rights, respect, and control over their lives. Be genuine in your interaction. Look people in the eyes, listen to them, and respond with fairness, compassion, and a light heart. Help everyone feel respected and heard when facilitating conflict resolution. Be alert to the bully-victim dynamic. Consider the possibility that almost everything expressed in a negative way is actually a request for help. If someone is playing the “bully” role in a conflict, it is often the case that they are subconsciously asking for help. People have different unconscious defensive strategies – some attack, some withdraw, some complain or whine, etc. Therefore, don’t judge, criticize, or take sides. In all but the most severe cases of conflict, maintain a no-fault, no-blame attitude, allowing individuals to change their decisions by learning from their choices without coercion. Develop the skill of giving consequences rather than exacting “punishments.” In my opinion, this is probably the most important conflict resolution tool I know. While what follows are some ways to portray consequences, the full method is beyond the scope of this article. Make an agreement on safe behavior. If that agreement is broken, have a heart-to-heart talk about it. Make sure each person understands what is safe, what is not safe, and why. Again, get agreements. If they are broken again there is no punishment, but now it’s time to decide on what the consequence will be if the safety rules are broken a third time. Make consequences fair and clear. See if everyone involved can determine and agree upon the potential consequences for the next safety break. If the agreements are broken again, give the consequence, let them know what the next consequence will be, and tell them what you need from them to lift the current consequence. If you can understand how to give consequences in a fair, respectful, and firm way then your relations with people will transform, and you’ll find yourself with much less frustration. The Swasher equipment in our Adventure Quest LARP programs are extremely popular among our Questers. They love to sword fight! And why is that? First, it’s fun! Beyond that, kids are physically small and have comparatively little power and responsibility in a world of big people telling them what they can and can’t do. This leads many children to feel disempowered. Disempowerment can present itself as a lack of self-esteem, confidence, and determination. It can also force children to withdraw into insecurity and shyness, or to overcompensate by becoming a bully or blindly rebellious to authority figures. Sword is seen as a tool of power that is very attractive, symbolic, and meaningful to the kids. We’ve found that Swashers can be a very useful teaching tool to awaken a respect for physical and emotional safety, and an awareness and understanding of the bully-victim dynamic. Our Quest Leaders use the LARP and Swashers to bring awareness to these dynamics and other issues like competition. The QLs role-model how to play fair and be empowered while simultaneously being respectful and compassionate. Those children who are unconsciously or consciously hurting others with their swords or with their words become highly motivated to act less impulsively when faced with the potential consequence of not being allowed to use the Swashers– their symbol of power. In other words, they are given the chance to act responsibly with their power, and if their actions become unsafe, their symbol of power is suspended until they can learn to act safely. I believe that interactive storytelling and roleplaying can truly transform traditional education. One of the long-range goals of Renaissance Adventures is to partner with educators and summer camps, creating a product line of books and training programs that support teachers and counselors to use these tools in the classroom and camp setting. If this article inspires you, then consider how you can use your passion for games or experiential learning to help others. Who do you like working and playing with? I have a friend who volunteers at an in-house treatment facility for teens with substance abuse issues. He leads a tabletop roleplaying game with the teens once a week. The teens really appreciate the gaming, and he gains the satisfaction of knowing that, not only is he bringing them some joy and play, he’s facilitating their learning and growth. I was once asked by a parent of a four-year old if I could help the boy stop his daily habit of hitting other kids. I met the boy for an afternoon of play, and I never even mentioned his bullying behavior. He and I hiked into a park with Swasher swords, and within the LARP, the boy – his character – witnessed an ogre bullying a small fairy. Seeing the poor fairy’s fear, hurt, and tears, the boy chose to defend her against the ogre. Then he started talking with the ogre and eventually befriended him. By interacting with the ogre within the context of a simple LARP, that boy learned to step into a different role than the bully, learning a tremendous amount. His habit of hitting kids was transformed by one afternoon of roleplaying. I’m passionate in my work with children and teens. At Renaissance Adventures, we lead summer classes with 80-100 participants who sign up for week-long programs, Monday through Friday, either half-day or full-day. Those children and teens are divided into small questing groups of six similarly-aged players. 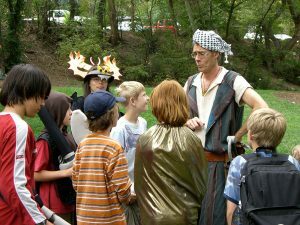 Each group is lead by an adult who is trained and skilled at leading Adventure Quest adventures, acting, storytelling, and leadership. We also run PlayQuest birthday parties, school holiday programs, and afterschool programs. We see the potential to offer these programs and methods to others, but cannot do it alone. 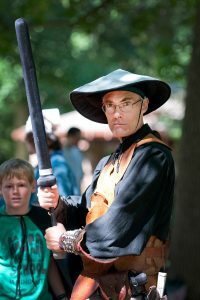 If you are interested in learning more about launching your own experiential learning LARP for kids by starting a licensed business, or adding this program to an existing camp or activity, please feel free to contact us! I hope that this article will be useful and inspiring, and that we can revolutionize children’s education through interactive, kinesthetic storytelling – through a live-action roleplaying game. Thank you. To contact Renaissance Adventures regarding this article or any idea surrounding experiential learning through live-action roleplaying games, feel free to contact us! Thank you for reading, and may your adventures be heroic!